The Hat People Eight Panel Cap has become popular with men and women alike. Traditionally worn with the top pulled over the brim, pushing the hat back to frame the face and hair has also become popular. Because the Newsboy Cap is worn both pulled forward and pushed back; Hat People does not put a snap on the bill. I have always pulled the top of my hats forward; while my wife, Carol, wears her Newsboy pushed back. We've both been impressed with the hats' ability to stay in place. 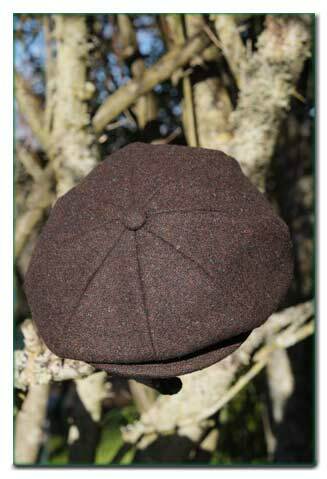 The colors of the cap featured on this page are a dark brown with light brown alternating in the herring bone pattern. There are also off white spots overlaying the herring bone. Of course, Pendleton Wool is great in the rain and snow. If you are confused about what we mean by medium, deep, full and Xfull cuts, please visit our Touring Cap Cuts page. The best way to determine your size is to measure your head with a cloth sewing tape. More on this subject can be found on our Ordering Information page. We're here at the Hat Ranch most of the time, so if you have any questions please call us during regular business hours, Pacific Standard Time, phone 1(888) 930 4287 or email is good too.